We eat salmon about once a week in our house. It’s quick and healthy, and most importantly something that I know everyone will eat. This is HUGE because my kids are one and three years old, and finding something that everyone will eat (with no complaints) isn’t always easy. Top that off with the fact that my husband, while he loves fish, used to hate salmon (too “fishy” he said). Well, this recipe made him a believer. It couldn’t be simpler, yet so many of my friends shy away from cooking fish because they think it’s complicated. I’m here to tell you that a fresh piece of fish needs nothing more than the right cooking method and maybe a sprinkling of salt and a squeeze of lemon to make it shine. 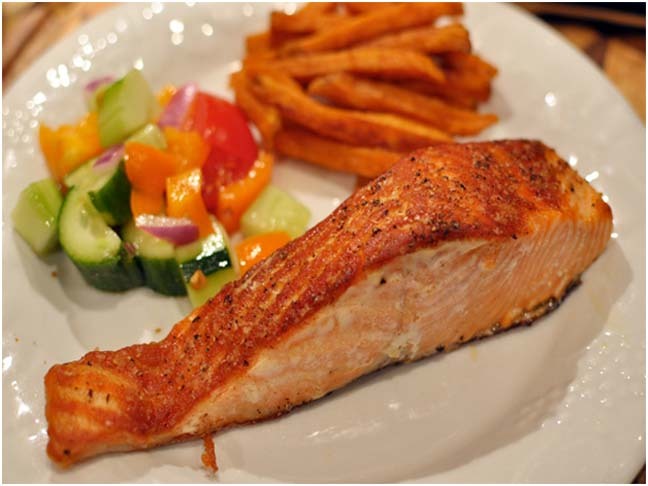 If you’re looking for more “easiest-ever” recipes for kids’ favourite dinner staples, check them out in the slideshow, or read on to learn how to make the best salmon recipe ever. It couldn’t be easier or more fool-proof. The ingredient list for making this salmon is embarrassingly small. But that’s what’s so great about it. The crispiness doesn’t come from fancy panko breadcrumbs or some elaborate batter (who has time for that? ), it comes from pan searing the outer flesh in a screaming hot pan for a couple of minutes before finishing it off in the oven. This method gives the outside a slightly crispy texture while allowing the inside to remain moist, juicy, and well, just perfect if you ask me. If you like your salmon a bit on the rarer side, simply pull it out of the oven earlier. I love to serve this fish alongside some brown rice and a fresh roasted corn and avocado salsa. It’s even delicious served cold the next day over some salad greens. Step 2: Heat a large oven safe skillet over high heat. While pan is preheating, pat dry each piece of salmon with a paper towel. Brush fish evenly on both sides with olive oil and season flesh side with salt and pepper. Step 3: Place fish into pan, flesh side down and allow to sear for approximately 4-5 minutes. Use a thin metal spatula to loosen the fish from the pan but do not force. If the fish isn't budging, wait a little longer. It will release easily when it's ready. Flip fish to the skin side and pop it into the preheated oven. Cook for about 10-12 minutes for well-done or 8-10 for rare. If you want a more rare piece, remove the salmon at 8 minutes. Serve alongside rice and your favourite vegetable. Enjoy!